Dr Johnson once said, in relation to the death penalty being handed out for sheep-stealing, that if you raise sheep stealing to the level of murder, then you reduce murder to the level of sheep-stealing. The same could be applied to some of the sentences being handed out as a result of last week’s rioting and looting in England. One person, for example, was given 6 months in prison for stealing a few bottles of water. A sense of proportion is being lost. In the same way that a collective hysteria resulted in looting by many people who would not normally have stolen, so is the judicial response also proving to be to some degree hysterical. The politicians gave the judges the nod to be harsh some days ago. Yet David Cameron is now saying he is glad the judiciary feels free to hand out extra tough sentences, as though there has been no political involvement. You learn a lot about collective behaviour at these times of crisis, and also about the real positions of the politicians who lead us through them. When Princess Diana died, we saw Tony Blair’s populist genius in his ‘people’s princess speech’, and we saw collective grief on a scale we had never witnessed before (that Tony Blair also predicted), much of it because a symbol had been lost. When 9/11 occurred, Tony Blair the religious warrior emerged, prepared to go to bed (in the passive position if necessary) with whatever politician shared his views on good and evil. David Cameron’s right wing instincts are currently on display. He has unreservedly praised the tough sentences being handed out, and while there is a case for these, there is not for the disproportionality. Boris Johnson, the Tory Mayor of London, is also behind the judiciary, but it has always been clear there is a nasty right-winger beneath the bluff, jokey exterior. As in, for example, his reference a few years ago to pickaninnies, which basically means the same as ‘wogs’. Being loveable, clowning Boris, he got away with it. It’s difficult writing about politics, because as soon as you criticise a politician, a lot of people assume you are from the opposite party and are being biased, and shame on you for using astrology to justify your political leanings. My position is that who I would vote for depends. Generally I trust the Tories more to balance the books, and Labour more with social policy. At present, our national debt is huge, and could still topple us a few years down the line. I trust the Tories more than Labour to ensure this does not happen. I also think something urgent needs to be done about welfare spending, and I think the Tories are more likely to do something about it, though I might not always like their methods. However, just as left-wingers can be mindlessly anti-capitalist (and capitalism is just part of human nature: we need it but it has to be controlled), so too do you get Tories lacking feeling for their ‘inferiors’. This is the Tories as the ‘Nasty Party’ (an appropriate play on ‘Nazi’). I don’t think it would be politically too difficult for David Cameron to give out a message of ‘tough but proportionate’ on sentencing policy, but he is not doing this, and it gives the impression of a right-winger bashing his inferiors. 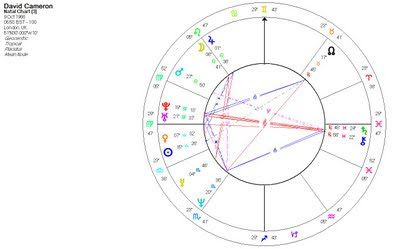 This is David Cameron’s Mercury in Scorpio square to Moon-Jupiter in Leo. 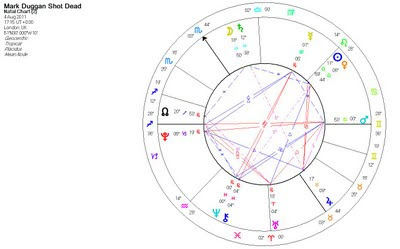 Moon-Jupiter in Leo has natural leadership abilities but also, at its worst, a sense of entitlement to rule, a sense of superiority and lack of feeling for those seen as inferior. But it is concealed by Mercury in Scorpio. Someone I know has Moon conjunct Neptune in Leo, without the Scorpionic concealment, and they are straight up that there are superior and inferior classes of people, that is just how life is, and that the credit crunch was caused by the lower classes spending too much! In a way this person is right, in that humanity, like a pack of dogs, is hierarchical: we wouldn’t for example have celebrities without it. But that doesn’t mean it corresponds to anything real. Of course there is such a thing as superiority when it comes to e.g. talents and achievements (and this is classically Leo/Capricorn), and it’s important not to let tall poppy syndrome get in the way of that. But that doesn’t make one person ‘better’ than another, let alone a whole social class better than another. 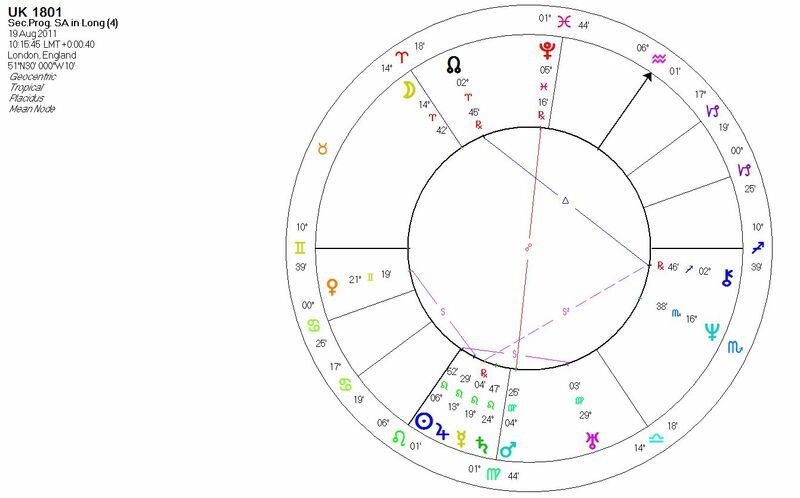 David Cameron’s Leo Moon is ruled by his Libra Sun, and it is the approaching Mars square to his Sun, and more immediately to his Libran Venus (popularity in a politician) that is governing his actions. Mars is currently squaring his Venus, and he feels he has to be aggressive (Mars) to be popular (Venus). Mars, unsurprisingly, has generally played a central role in the riots and their aftermath. 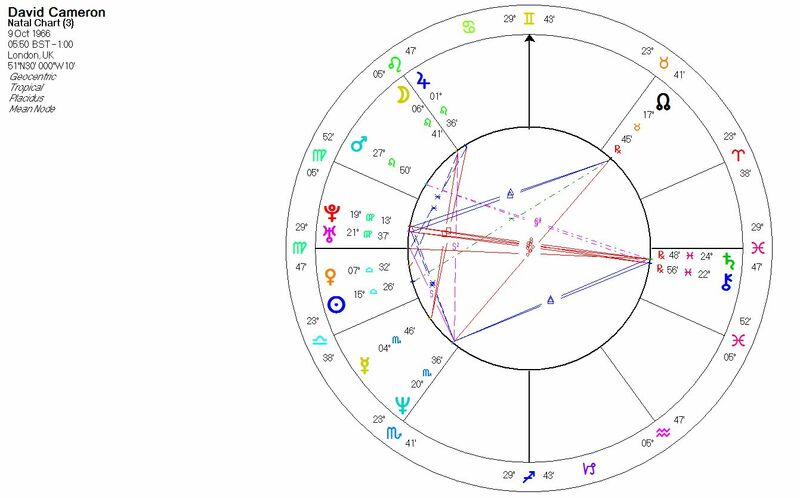 Mars is in early Cancer, in a t-square with Uranus and Pluto. That is heavy and explosive. All the planets in that t-square are now separating from each other, so the intensity is easing; but at the time of the police shooting of Mark Duggan, and the beginning of the riots, the t-square was applying, particularly from Mars. Astrologically, it was a tinderbox, that hard-aspected the UK Uranus-Asc conjunction and Sun-MC opposition. Hence their national significance. What seems to have been forgotten is that these riots were triggered by the police shooting dead a black man (who Boris Johnson might call a pickaninny). The police claimed the man had shot first, but people obviously didn’t believe them, and it turned out later that the police had indeed lied. They claimed the lie was simply miscommunication, but you don’t make a mistake about something like that. The police shoot dead a black man, lie about him having fired at them, and people riot because they rightly don’t believe the police. There was justified grievance on the part of the rioters here, and it’s the only course of action people have when the police are against them. Of course, the riots escalated into something else that the politicians can unreservedly condemn, but the part of the police in causing it has strangely been forgotten. When Mark Duggan was shot, Mars had just changed signs and was moving through the 9th House of the UK chart. The 9th House is the Law, and Mars is aggression – an instinctive planet in the instinctive sign of Cancer. It was probably spur of the moment, unlike airy Mars in Gemini, under which the carefully planned Norwegian slaughter took place. 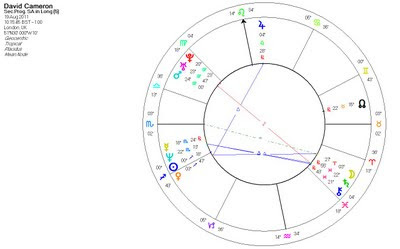 A policeman felt threatened and opened fire without thinking: that is what the astrology is telling us, particularly when you see that Mars is also in an applying square to Uranus and opposition to Pluto. We do know that an illegal firearm was recovered from the scene, and if Duggan was carrying it, then I think it’s his look-out if the police shoot him. But the police have already lied in a big way, so did they also plant the gun afterwards? At the time of the shooting, Mercury was stationary retrograde closely opposite retrograde Neptune, with both planets about to change sign. Mercury is the planet of communication, and with this aspect it is very hard to know where the truth lies (no pun intended.) It is certainly the aspect par excellence under which to tell whoppers, like the police did. 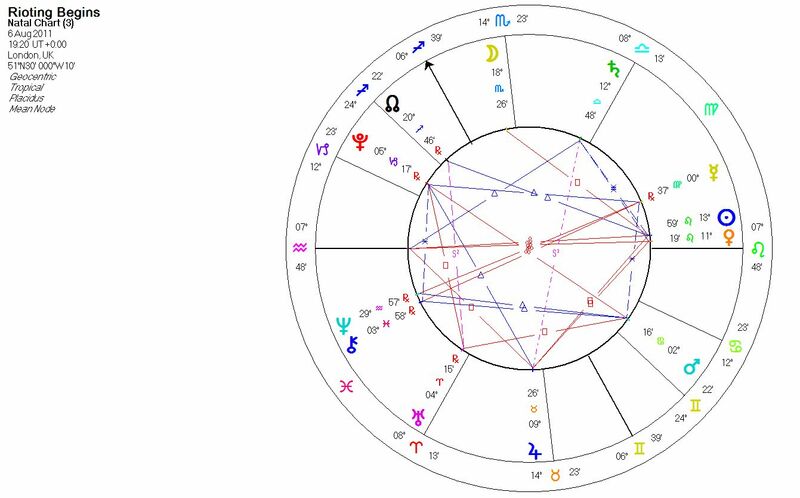 In itself, the shooting chart has a Mars-Pluto opposition lying along the Asc-Desc axis. So death (Pluto) as well as aggression (Mars) was intended on the part of the establishment (Capricorn)/Police (Sagittarius). The North Node was also conjunct the Ascendant, in the sign of Sagittarius (the Law/Police). This adds significance to the event. And the Asc was closely opposite David Cameron's MC, suggesting an important moment for his career. So I think attention will focus once again on the shooting, once the bigger, morally more cut-and-dried issue of the rioting has died down. The rioting began 2 days later. 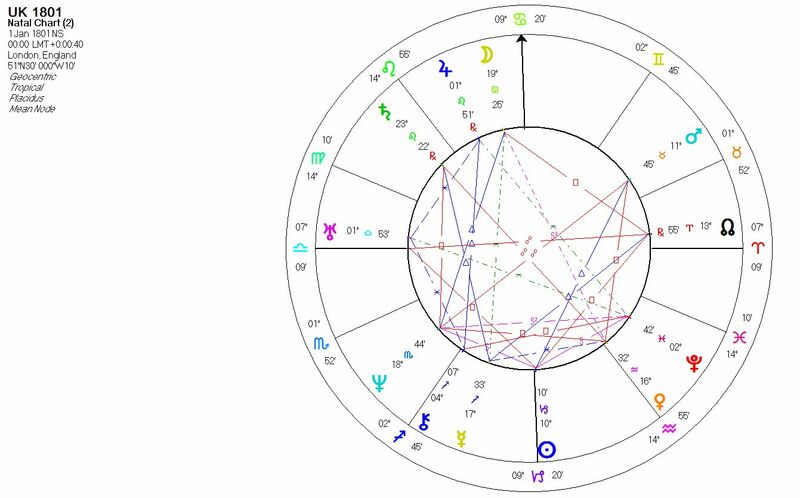 In a mundane chart, the Moon is the people, and here we see it in Scorpio in the 9th. Scorpio has a strong sense of justice/revenge, and in the 9th, it is the Law/Police with whom it has this grievance. Aquarius Rising shows the sense of rebellion. So this was how the riots began, even though they turned into something else. The actual aggression, Mars, was in the 5th, showing the part young people came to play. Being in Cancer, and opposite Pluto, reason was soon left behind. 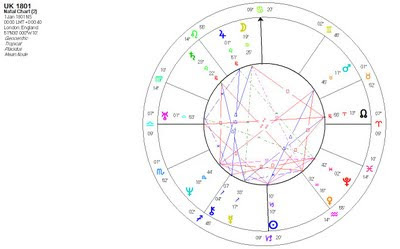 The UK Progressed Sun/IC is closely conjunct Cameron’s Moon, so this is a time when he can take a lead. 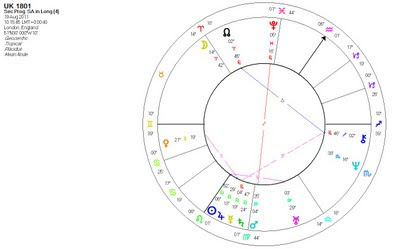 The UK has a Progressed Mars-Pluto opposition that will be applying until the end of 2012, so further protests and outbursts of violence and rioting are likely. Some have described the rioting as Cameron’s ‘9/11 moment’. 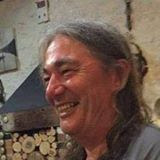 He has seized it, just as Mars conjoins the UK MC, as an opportunity to promote the social transformation, the ‘big society’, that is central to his political philosophy. The focus will be on less government and more local community involvement, and active intervention at an early stage in families locked into welfare and criminality. It could be read as a restatement of traditional Tory policy: less government, ‘on your bikes’ to those on the dole, and boot camps for young criminals. This is just as Neptune is entering Cameron’s 6th House of work. A leader is a public figure, in some ways they ARE the collective, and I think you can therefore give a mundane interpretation to their charts. In this case, one meaning of the 6th House is ‘the working classes’. This could be read in an appalling way as redeemer of the lower orders, and as a Tory there’s bound to be a bit of that flavour, but it doesn’t mean he won’t do a lot of good. Neptune may give a more compassionate flavour than we experienced under Thatcher. 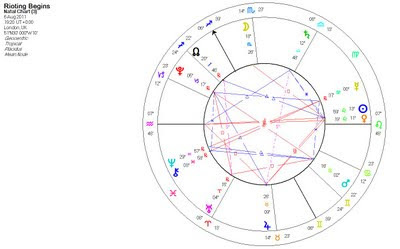 In the UK chart, Neptune is about to pass over natal Pluto in the 5th House of children: we saw this transit in the riots, where most of the offenders were teenagers and young adults, and we will no doubt see a response in terms of government policy and intervention in the next few years as the transit progresses. In an individual’s chart, a Neptune to natal Pluto transit may not be personally very significant. But a country ‘lives’ for so much longer, and being also a collective entity, these collective planet transits acquire a lot more significance. Pluto is also the country’s power, and the sign of Pisces reflects Britain’s naval power in 1801. 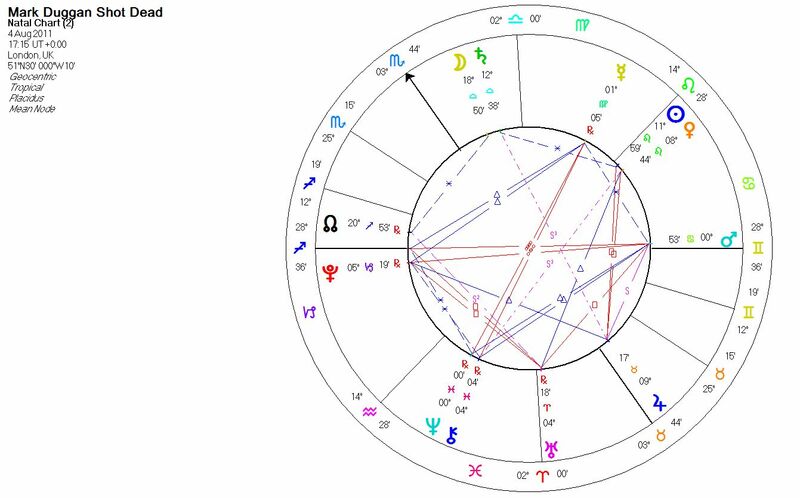 You can also, rather fascinatingly, trace the rise and fall of the British Empire – its time as a world power - by the long Direct and Retrograde periods of progressed Pluto. For example, Prog Pluto was stationing at the end of WWII, and moved to retrograde in the 1950s: this was the post-war dismantling of the Empire. The Neptune-Pluto transit over the next couple of years is also like to mark one more downgrade in Britain’s place as a world power, which will complete as Neptune also passes over Progressed Pluto at 5 Pisces in a few years time. Just as people are often more real in failure than in success, so too do I think it will do Britain good to wear shoes that fit. We don’t know what David Cameron is like yet (just as we didn’t know Blair till 9/11), but with Pluto squaring his Sun over the next few years, and with the rioting providing an opportunity for implementing his social philosophy (which he has always said is his main political goal), we are probably soon to see what type of leader we really have. His Progressed Sun has just moved into Sag, trining his natal Jupiter: so his beliefs will be coming to the fore. And with prog Moon in the Prog 5th in Aries, these beliefs are likely to result in initiatives around young people. So you think that the Courts should say to the convicted rioters and looters "There There...We understand - Now don't be a naughty little boy/girl - go away and sin no more"? David Cameron is right that tough sentences should be imposed so that a signal is sent out clearly that this kind of behaviour does not pay. That is not hysteria. That is common sense. Oh, and for what it is worth - I NEVER believe that any human being is my "inferior" - however unacceptable their behaviour. Hey! You didn't read me properly! I said there's a case for being tough, but not for being disproportionate. In the long-term, it undermines the justice system. There will be a backlash down the line. Hi Great post as usual - love your work. This is just an astro question - I see you use the 5:50 time for Cameron but on the astrodb there was a 5:55 and 5:51 time from you. Doesn't matter for the article of course but just wondering why you like the Virgo rising one. Thanks as ever for a such a reasonable, considered analysis of the events. At times like these I really value that Aquarian detachment. Good to remember the spark was the shooting and killing of a (black) man by the police (in 2011). This is sure to bring toxicities to the surface. Right now those few days of cardinal cross are revealing some outrageous stories not just in Britain. I am humbled by the astrology of it all. As others have said, a very good and reasonable analysis of recent events. One thing I'd like to add is that the late Sag asc when Mark Duggan was shot is very close to the Galactic Centre (with Mars virtually opposite it). 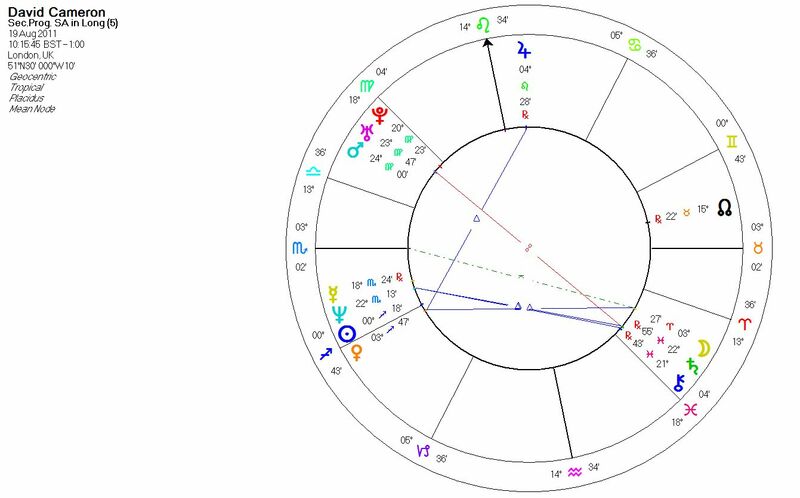 This is a very powerful point in a chart and it's often prominent in disaster charts, either on an angle or through planetary placement. I don't think we've seen the last of these disturbances, either. I completely agree with you about the lack of proportion, but I'm glad to note that the appeals system is kicking into action. You may have seen this already, but here's a link to Tony Blair's analysis of the riots. Although, I kind of can't stand him, I think what he has to say on this occasion is useful. Thanks Christina for the Blair link - most sensible thing I've read yet ( from a non astro then!) and someone who actually does know the problem. I also completely agree with you on the lack of proportion. Instead of jail terms for these young people, Cameron should strike a deal with Harper, Prime Minster of Canada to send these youths to Canada. Canada has a huge under developed prairie. These young should be given a parcel of land to farm producing food to feed themselves, the poor and generate revenue. Didn't England send people to Australia? How about Canada now. They will have to stay on the prairies and not move to the big cities. My two cents worth. I am a big fan D. Keep writing. Then you do TCOOST and you do it with HARPER. And it's all about SASLAV 88 with CARMEN- NATHALIE.